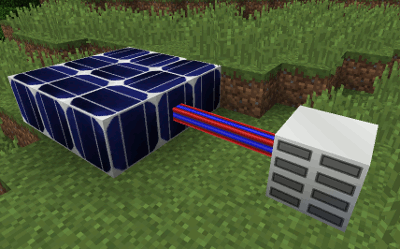 The Battery Array holds up to 8 batteries, which it uses to store excess electricity and to power connected machines. The battery array is crafted from steel plates, a steel frame, a Power Supply Unit, and a chest. Battery Arrays are most useful when combined with a generator that does not have constant output, such as a Photovoltaic Generator or a Steam-Powered Electric Generator.